Social Media continues to grow in importance. It has not only become one of the critical tool to interact with customer but is also considered one of the key elements impacting organic search and ranking for the hotel. Hotels that take advantage of this trend are seeing significant benefits in terms of online placement and revenue. The most common question that we get asked in the hospitality industry is why I should be concerned about social media and how will I benefit from the social media elements. Several months ago, we published an article in this column describing how hotels can maximize the gain from Social Media channels. Of course, as we expect, even in the 12 months since we published the article things have evolved in the Social Media space. Whereas Twitter was around, the effectiveness of the tweeting model was not well understood until the presidential elections towards the end of the year. A quick follow-up to these questions is of course, how should I go about optimizing for social media and measure the ROI. In this article, we address these questions that we often come across. The content in this article is based on a lot of practical experience we have gathered over the last 2 years while working on social media optimization strategies for our clients. Here are the top reasons why every business interested in internet marketing should be looking at Social Media. Social Media offers an opportunity for you to establish yourself as an expert in your market. Use of blogs, twitter, etc can help you establish yourself as an expert in your destination. People like to buy from experts and also like to follow experts on their blogs post, tweets etc. Consumer reviews and user generated content still dominates hotelier’s view of social media. While the consumer reviews are absolutely critical and a potential gold mine for hotels running good operations, social media extends way beyond consumer reviews into several other social media channels. 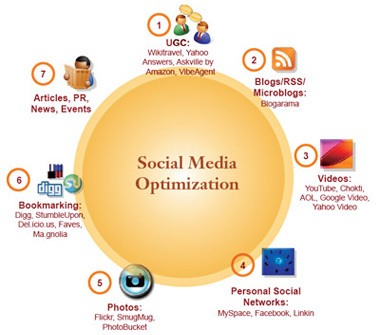 Last but not the least, social media optimization is the next generation of Internet Marketing. 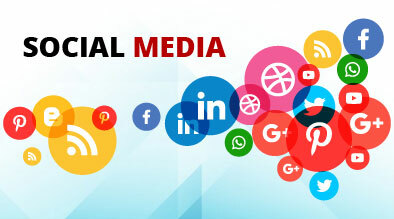 Search Engines give higher relevance to businesses connected through different social media channels resulting in higher placement in search engines. Now, that we have made a strong case of why you should be investing in Social Media, the obvious question that pops up is how I should go about doing social media optimization. This section of the white paper discusses various social media strategies that can be adopted by hotels. In our experience, we have found 2 categories of hoteliers – ones who are interested in dabbling with social media but are concerned about the expense and time investment needed to manage it, and the second category who are aggressively going out and investing in social media to gain an early mover advantage. We suggest two different strategies for each of these categories. Interlink the channels so that the hotel gains from cross-fertilization between the channels. There are apps and plug-ins available that can be used to interlink the channels. The benefit of interlinking is that a “new special offering” post on your blog automatically shows up on Facebook and Twitter. Any pictures posted on Flickr automatically show up on your Facebook account and myspace page. Channels Are Set-up – What Next? User generated Content – monitor the reviews being posted once a week and respond to any reviews that you think need a response. Management response can turn a negative review into a positive marketing bullet. Social Media Channels – For simplicity, we will include Facebook, myspace, and twitter all as part of the social media channels although, technically, Twitter is a micro-blogging channel. Across all these channels, the goal is for the hotel to be part of a group that share common interests with the hotel – destination information, events in your market, your initiatives such as green, pet friendly, etc. and then constantly interact with the group and offer value. Join any groups or friends on the channels that share a common interest with your hotel – destination, Green, pets, etc. Discuss things to do in your destination – use each week to discuss one attraction or thing to do. Talk about things or events happening in your market. If there is a conference or an event in your market, become a part of their social media club and offer specials and packages for the event and conference. Discuss any key initiatives at your property – green, conserving energy, pet-friendly, etc. Keep your photos updated on flickr, facebookPost the video on youtube, facebook, etc. For hotels that have already dabbled in the starter strategies for Social Media and have seen reasonable success through those strategies, you can take the more aggressive strategies and delve deeper into the social media world. In one of our previous articles “ Social Media Optimization Strategies for Lodging Industry,” we had discussed the advanced social media strategies. We divide the social media landscape into 7 different categories as per the chart below. Use this link below to check out how to conduct advanced social media optimization across multiple social media channels. Although both the items above are related, there are different mechanisms for measuring the 2 goals. Milestone recently launched a Social Media monitoring tool eBuzz Connect which tracks how much buzz you have in the social media channels. There are several such tools available in the market. These tools tell you what people are saying about you on different channels, video views, photo-views, etc. and benchmark your performance month over month to determine whether the social media strategies are being effective or not. For example, you can track the number of video views month over month or track your Facebook fans month over month and determine that the social media strategies are effective in generating a buzz about your hotel. 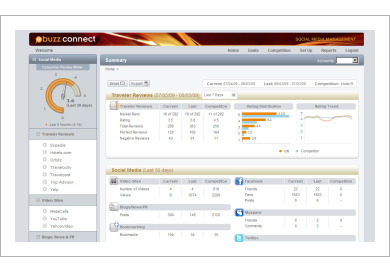 An added advantage of such tools is that it offers a single interface for all your social media monitoring. The return on investment from social media channels is harder to track vs. the buzz created by the channels. The reason for this is because the conversion from Social Media Marketing efforts occurs on channels different from the social media channels – for example, either a client will book on a hotel website or on the phone even though they found the hotel on Facebook or on Twitter. The best mechanism to track conversion from social media channels is to measure the leads (website traffic) generated from the social media channels. This can easily be done using simple website analytics tools. In addition, you can determine how many visitors from the social media channels went into your booking engine. Using your conversion ratios, you can get a very good estimate of the ROI from your social media channels. A secondary measure of the ROI and effectiveness of your social media strategies is to look at the impact of social media optimization on your search engine results. For example, when you type your hotel’s name on the search engines, you will find that after the first couple of listings which should be your hotel website, the search engine page shows results from various 3rd party affiliate sites. With aggressive social media optimization, you should see that universal search results will help your hotel’s social media channels dominate the search results pages. That ensures that all the leads come directly to you and is also an indicator that your overall search engine recognition is increasing. Several, Social Media naysayers will argue that until the actual return can be determined, the channel may not be effective. Although, the techniques above are less objective than measuring conversions from paid search advertising or banner advertising, above mechanisms do give the hotels a fairly good idea of the returns and effectiveness of the social media campaigns. As the technology advances happen, we are positive that there will be ways to measure social media effectiveness more accurately. The big question for us as hoteliers is whether we wait until then, when several of our competitors are ahead of the curve or do we invest today in the media that is bound to be the future of internet marketing. Can you expand on how you can determine how many visitors from the sm channels go into the booking engine? Thanks for your question. This is done by measuring the leads to your website using simple analytics tools, and evaluating what sites spawned the inbound leads to the booking engine. In order to do this effectively, you will have to create some type of tracking code and embed it into your website, either through proprietary means or from one of the many free products available online.